Nepal: A Tourist's Manual: How to Avoid Food Poisoning in Nepal? How to Avoid Food Poisoning in Nepal? This picture was taken as I passed along a country road. They are preparing a food item for a festival celebration. They were outside. Flies were buzzing around and it looked totally diseased. There is little in the way of government inspections. I recently had a guest who got a serious bout of food poisoning after countless others who had the lesser stomach issues from contaminated food. It sometimes goes like this: Day one they mention they’ve gotten a stomach problem but it’s much better. Day three or four they are staying in hoping the rumblings aren’t going to turn into anything serious. That is how it usually goes throughout the time they are staying with me, which usually becomes a longer stay due to health concerns. If you have a stomach bug that comes back you need to take a stool specimen to a lab. Each time the eggs hatch in your intestines you will get a bowel issue. Some of these critters can cause problems for years and even invade other parts of your body. Many people seem to learn to live with them and consider the problem to be irritable bowel syndrome. Most of the hospitals have labs, but you do not have to actually go there. You can give the specimen to your guest house staff along with a tip and he can take it for you. 500 rupees should cover the cost and the tip. There are community hospitals all over Kathmandu. For example, Chhetrapati Community Hospital and Bir Hospital are just at the edges of Thamel. You can have him go back and pick up the results in a couple days. Take that to any pharmacy and purchase the appropriate medication. As I’ve mentioned in another blog post, it’s best to go to pharmacies that are attached to a hospital to avoid counterfeit and low quality medications from China. My eBook, Nepal: A Tourist’s Manual, has many suggestions on the types of restaurants to frequent, where not to buy cooked food items and how to order for health. But I will add a few new tips here and elaborate on a few of the tips from the book. My worst Delhi Belly experience was when I moved into my apartment that only had an Eastern toilet at the time. I thought I would have samosas for lunch and put a few in the refrigerator for dinner. I learned the value of the Western toilet that night. Never take a ‘doggy bag’ from a Nepali restaurant unless you plan to feed it to a dog. That is rule #1. The second thing you need to consider is the temperature of the food when it is served to you. If you order a meat dish and it is cold from the core you will have a high likelihood of a serious problem. A lot of the food is prepared ahead of time and actually left uncovered for hours. If it gets heated sufficiently then you are fairly safe, but that doesn’t always happen. There are usually only two burners on the stove in restaurants. I seldom eat the raw vegetable garnish, or salad, that comes with many meals. There is a very bad, stubborn bug that grows on the leafy green vegetables, particularly during the monsoon season. The other problem with eating the salad is that it is placed there with bare hands. There is seldom a bar of soap in the toilet, so it doesn’t take much imagination to understand how dangerous that can be. Kachila is one food item that should be avoided. It is actually raw buff meat, as the name in Newari suggests, raw meat, then it is rolled with bare hands. Sekuwa restaurants feature bar-b-que cooking and usually have delicious foods on the menu. Just make sure the meat is cooked and served hot. 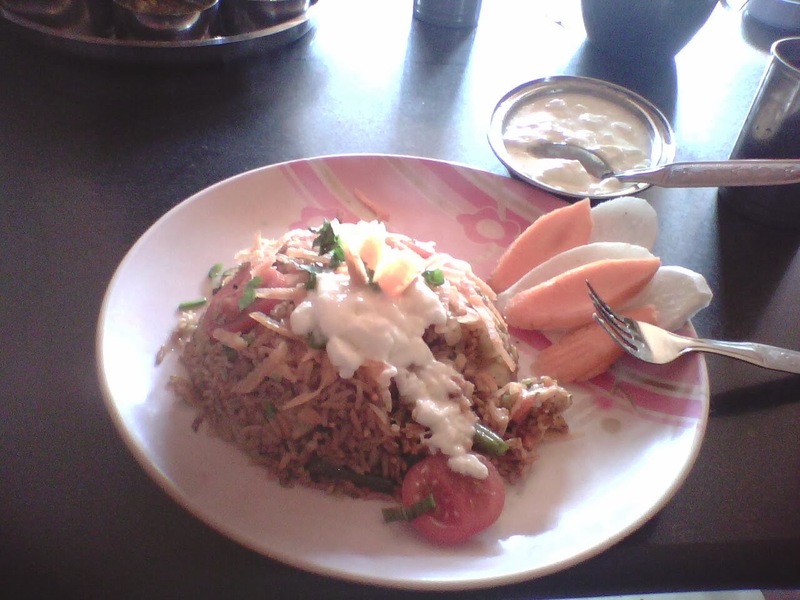 Tandoori restaurants also serve excellent dishes. Avoid any buffets. The Newari community typically does buffets, but they are seldom covered properly, nor are they reheated properly. I have many guidelines in the book, including my favorite tip for getting a great budget meal; I suggest looking at the last page of the menu for local bargains. Be sure to point to it on the page so they will charge you the local price. You can usually see the same item listed elsewhere for more money. One last tip that should be too obvious to mention: Never eat from a street cart! I hope these tips, along with the others from the Eating Out chapter, will keep you healthy. There are over 12 pages in that chapter with over 50 other tips on food and eating out in Nepal. Bon Appetite! This blog post seems quite informative. Since i was looking for Restaurants in Kathmandu so this post helped me a lot.